Have we completely lost our minds?! Over the next few months ShoptobeGreen will feature family friend and contributor Erin D. Erin will share with us her experience in going from a 200 year old farmhouse in the rural North East to a more eco-friendly and energy efficient 3 season cabin. We have all dreamed about living off the grid but Erin and her husband are trying to make that dream a reality. ShoptobeGreen has talked Erin into sharing their experience with our readers. We have even talked her into sharing their videos and hand draw design concepts. Please leave your comments and any advise you might have and we will be happy to share it with Erin. 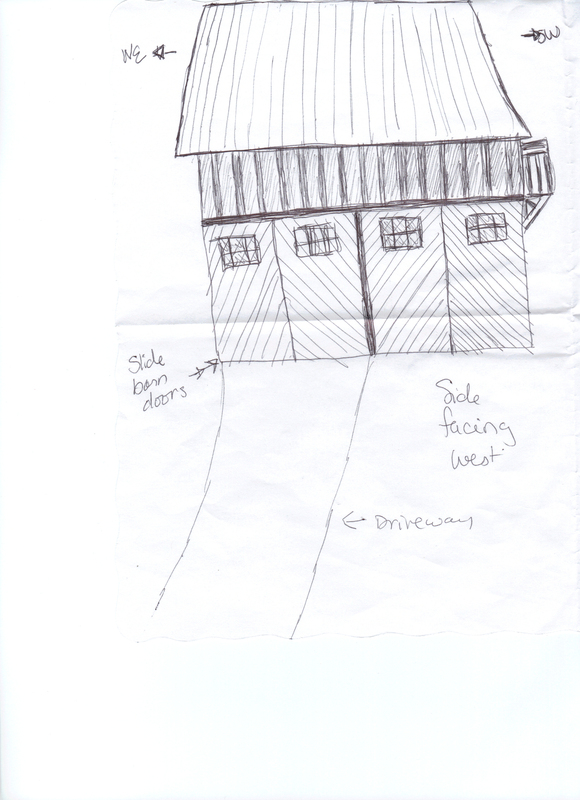 Erin and her husband have sold their farmhouse and have begun the process for their new cabin. The land is virgin and untamed (well, recently untamed it was farmland once upon a time)… The days are long and hard on this virgin-ish land, the nights are lulled (maybe not lulled more like screeched) with the song of coyote and bullfrogs. Woods, streams, bogs and bugs… A lot of bugs.. Did I mention the bugs? Alright fine, I don’t really have a problem with bugs in general. But mosquitoes, are the bane of human existence! I really don’t like mosquitoes, who does? What is the purpose of mosquitoes? Ok ok, yes they do feed frogs, birds, spiders, etc., which is a good thing! Hakuna Matata , yada yada… But really, do we need to have so many? And why do they love me so?! But seriously, here’s the plan. 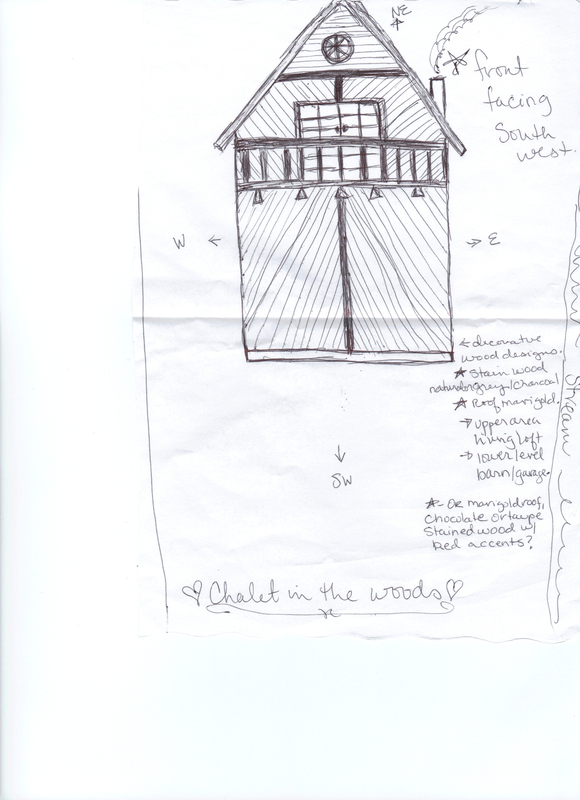 We want to build, as mentioned earlier, a small (450 to 500 sq ft) three season cabin/cottage. We want a place to get away, one we don’t have to worry about when back in the city. We will build as local, environmentally friendly and self sustaining, as possible on a $30k budget. The wood to build will come from local pine and cedar, as well as reclaimed wood if possible. To be energy efficient we will heat primarily with a wood burning stove, wood cut by my husband from hardwood trees already dead or limbs fallen. We discussed solar panels; but the winters are so long, snowy, and gray, that unfortunately we think they’d only be a vanity endeavor (if we were in the southern regions we would use solar). The structure will be facing southwest to capture as much sunlight throughout the day, the back northeast end protected by a hill, both helping to warm and protect the cabin in the cold northern winter, as well as not needing to turn on lights until dusk. A compost toilet is a must, as well as a rain harvesting system for gray water. That’s the required list as of today. I’m sure there will be more, but we are on a budget. I have to keep reminding myself this, budget budget budget. So, what’s been done (since the sale) in the past month? A road… Not a very well done road I might add. See, getting things done well and in a timely manner is always difficult when building and/or renovating, and when it’s in a rural area it’s even more difficult. There are only so many local contractors (3), and they are always busy. We’ve previously hired the gentleman who bulldozed this road, and he did a fantastic job in the past. This time around he looked at our virgin-ish land with it’s many mosquitoes, and didn’t seem so thrilled.. We had to pay and beg him for what ended up only a single pass with the bulldozer. He had a month to do the job properly, and yes we now have a road, but it’s a very uneven potholed dirt road that needs to be smoothed out and graveled before we can start construction. That’s it. This is how far we’ve gotten in a month. I’m hoping (wishful thinking?) that this will all be done by Autumn 2012.